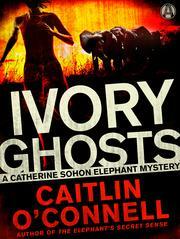 A field biologist dispatched to Namibia to stop ivory smugglers uncovers a threat to elephants (and humans) “more menacing than lions” in this debut novel. After writing a pack of award-winning nonfiction books about elephants for children (A Baby Elephant in the Wild, 2014, etc.) as well as for adults (Elephant Don: The Politics of a Pachyderm Posse, 2015, etc. ), O’Connell enters uncharted territory with her atmospheric mystery. This book for grown-ups introduces Wildlife Investigation Agency field biologist Catherin Sohon, the “eyes and ears only” participant in a census of the regional pachyderm population. Her actual mission is “to figure out who the players were in the local ivory trade.” Her job—counting the elephants and looking for signs of poachers—seems “pretty straightforward.” But on her arrival, she comes across a Mercedes sedan with four slaughtered bodies, including one whose brain has been removed. A fish out of water—she is “an American bloody do-gooder” and a woman—she initially runs afoul of Jon Baggs, head of the local Ministry of Land and Conservation, who resents her presence. “You said you were a pilot, not a bloody detective,” he says, dismissing her. Through the capable and committed Sohon, O’Connell offers both panoramic and “ground level” perspectives of an epidemic that threatens to decimate an animal population (100 elephants are killed in Africa on a daily basis, Sohon notes). O’Connell effectively maps out the usual and unusual suspects (a witch doctor) and dramatizes the institutional corruption, greed, and overwhelmed bureaucracy that hinder rescue. The anger and outrage are palpable, but not in a way that comes off as didactic. Less effective is Sohon’s back story. She has in part come to Namibia to grieve and “get my footing back” following the death of her fiance, who was killed by a buffalo. O’Connell is on firmer ground authentically capturing an Africa that is both “breathtaking and revolting,” where buzzing flies are “the first responders to an accident,” baboons caterwaul to ward off predatory leopards, and young elephant calves comically learn to control their limp trunks. A vibrant, muckraking mystery that will be difficult to forget.